This guide walks you through the steps of exporting to Sage 50 and Sage 200 Payroll. Deputy's integration with Sage enables you to export time and attendance data from Deputy into a formatted Excel file, which can be uploaded directly into either Sage 50 or Sage 200. You will need to make sure that the Employee Timesheet Export Codes in Deputy matches the Employee Reference ID in Sage. You will also need to ensure that once you import your Deputy timesheet into Sage, the correct pay fields are identified and mapped out. Employee reference codes in Sage need to match Timesheet Export Codes in Deputy. To view your employee reference codes in Sage navigate to the Employee tab to view your Employee List. Employee Reference numbers should be visible next to each employee in the leftmost column by default. These codes must match each employee’s Timesheet Export Code in Deputy. In order to add Timesheet Export Codes for your employees navigate to the People section of Deputy and select an employee to bring up their profile. Click on an employee to open their profile then click ‘Edit Profile’ in the top right corner. From the menu on the left choose Pay Rates and at the bottom of this screen is the ability to add a Timesheet Export Code for an employee. You must ensure this matches the Employee Reference code for the same employee in Sage. With the Employee Reference Numbers in Sage now entered in the Timesheet Export Codes in Deputy, you can export your Timesheets from Deputy. and choose either Sage 50 or Sage 200 from the dropdown menu. You will be prompted to download a CSV or Excel file which you should save to your desktop. Once your timesheet export file has downloaded, return to Sage and select File > Advanced Data Import. Here you will be able to select your import template, where you must select the ‘Timesheet Payments’ template. Here, Sage will prompt you to select your recently exported timesheet file from Deputy. With your timesheet file uploaded, you will be prompted to confirm that the imported pay fields from Deputy match up with your existing payroll fields in Sage. If the column names in your Deputy import file aren’t identical to the names you have set in Sage, you will need to manually map your import fields to match your Sage payroll fields using the dropdown lists. 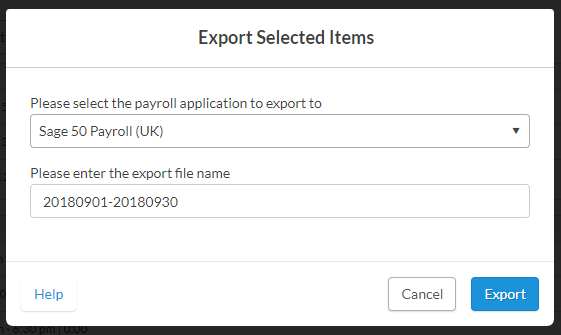 Note that there will be an extra row in the Import Field column for the employee’s full name, that will not have an equivalent value in the Payroll Field, so will be left blank. If the Import Field values are all blank you will need to convert the CSV file to a standard Excel file (.XLS) and upload again. Once you’ve correctly mapped out your import fields to map your Sage payroll fields, click Save Map. This will keep a record of all your pay fields, so that for your next pay run you can select this map to auto-populate your import fields. With this step completed, click ‘Finish’ to import your time and attendance data into Sage.